The mass viewing of Sunday evening’s solar eclipse at CU-Boulder broke world records, with close to 10,000 attendees filling the stands at Folsom Field. Organized by Fiske Planetarium and co-sponsored by the two NASA Lunar Institute teams from CU—the LASP Colorado Center for Lunar Dust and Atmospheric Studies (CCLDAS) and Lunar University Network for Astrophysics Research (LUNAR)—the event set a new record for the largest number of people to watch an eclipse in one place. Onlookers donning protective eyewear gazed skyward as a live video of the eclipse showed on the big screens in the stadium. While clouds waned in and out of the celestial view, music played, raffle winners were announced, and trivia questions boomed over the loudspeakers. The crowd cheered when the clouds dissipated just before the 7:30 peak of the annular eclipse, providing an unobstructed view of the Moon covering all but a ring of the Sun as the Sun set over the Rockies. Meanwhile, educational tables lined the walls near the gates to the stadium, offering handouts and activities for children. 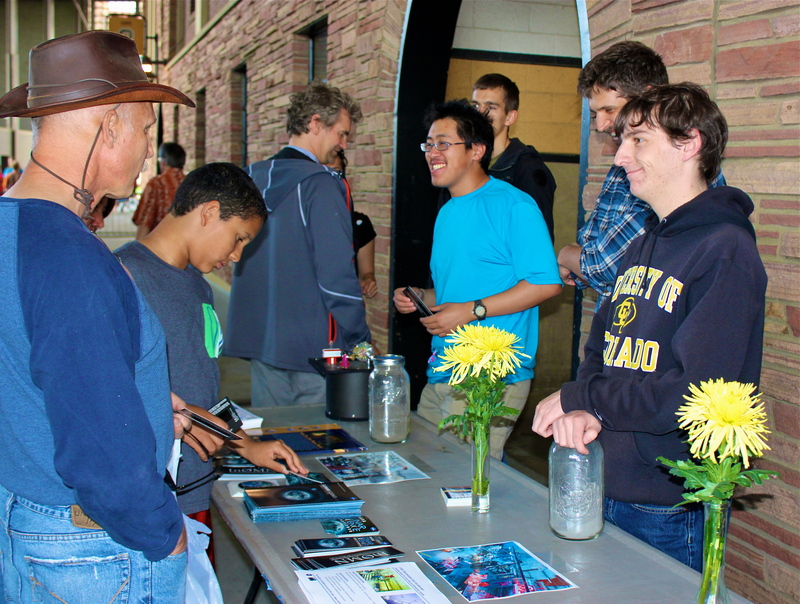 At the CCLDAS table, LASP staff and students spoke to families about lunar science, using jars of imitation Moon dust to explain their research on how real lunar dust affects scientific equipment in space. Solar eclipses are relatively rare, and occur when the Moon passes between the Earth and Sun, partially blocking the Sun from certain areas on Earth. The next ring-shaped annular eclipse visible in the United States will be in 2023, and the next total eclipse that will be viewable in Colorado will occur in 2025. 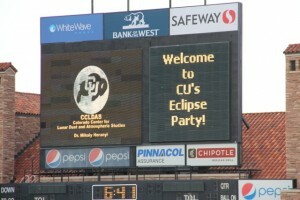 For more information on lunar science at CCLDAS(now called IMPACT), please visit http://impact.colorado.edu/. To see more images from the event, please click here.